The Smart Lock from Nuki is an extension to your home's existing lock which offers various ways to lock and unlock your door, including from the outside, using your existing keys, a manual button inside of the house, a bluetooth fob, a smartphone app and widget, a smartwatch app, IFTTT, the Web and through a Homebridge shim. With the Nuki Smart Lock Virtual Device for Fibaro HC2 you can lock, unlock or unltach your door with a single tap on your Fibaro web or smartphone app or through a scene that leverages this Virtual Device. 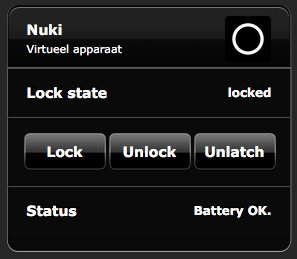 Nuki Smart Lock battery status. Timestamp of the last lock action (optional). At the same time, the following predefined global variables are updated with a numerical value, which can be used in (block) scenes. The Bridge is instructed to perform the corresponding lock action on the Nuki Smart Lock and report back lock action status. Whereas the Nuki Bridge can support multiple connected Nuki Smart Locks, the current version of the Nuki Smart Lock VD, will support only one Nuki Bridge connected Nuki Smart Lock. Whereas the Nuki REST API supports a rich set of functionality, including device discovery and maintenance, the current version of the Nuki Smart Lock VD, will support only certain lock, unlock and unlatch operations and the provision of associated status information. It takes 3-6 seconds before the Nuki Smart Lock VD confirms that the Bridge was successful or failed instructing the Nuki Smart Lock to perform the given lock action. It takes up to 24 seconds for the Nuki Smart Lock to perform the lock action on the door and report back its lock state via the Bridge to the Nuki Smart Lock VD. Lock states are requested from the Nuki Bridge via the /list command, which produces the last known lock state cached by Nuki Bridge. This means, that the Bridge does not connect to the Nuki Smart Lock via Bluetooth to retrieve its lock state. Whilst this provides the fastest available feedback and limits smart lock battery consumption, the drawback is that the last known state might not always be correct. The Nuki Smart Lock VD will not provide a lock action icon or lock action status indication when lock actions are in the process of being performed outside of the VD, such as by means of a regular key, fob, smart phone app, IFTT or through other means. After providing a lock action, the Nuki Smart Lock VD will replace its main device icon with the lock action icon for a few seconds and then go back to displaying the main device icon, which provides no indication of lock status. Current lock status is always displayed as text. Download and extract the zip file provided below to a folder on your computer. Locate the Nuki Smart Lock VD file (extension .vfib) in the folder and install by following the guidelines provided in the installation guide below. Open the menu in the Nuki app (top left) and choose “Manage Bridge” to search for your Bridge in maintenance mode. Note the Nuki Bridge IP address and enter this in the virtual device IP address field. Note the Nuki Bridge Port (default: 8080) and enter this in the virtual device Port field. Note the Nuki Bridge API token and enter this in the virtual device -> advanced configuration -> Main Loop section. Debugging. When disabled only main loop errors are shown. When enabled, the debug log will show detailed status information. Timestamp. When disabled the VD status field will only show battery status and lock action confirmations. When enabled, the VD status field will show the latest lock action performed by the VD, along with a timestamp. This information displays well within a browser, but does not fit the VD frame in the Fibaro smart phone app. Nuki, the Nuki logo are trademarks of Nuki Home Solutions GmbH ("Nuki"). The Nuki HTTP API is a service provided by Nuki and governed by the terms and conditions imposed upon you by Nuki. By downloading this Virtual Device you agree to be bound by Nuki's terms and conditions of service. If you do not want to be bound by Nuki's terms your only option is not to download the Virtual Device. Barlow and Fibaro make no warranty, express or implied, and do not assume any legal liability or responsibility for the right to disclose and publish Nuki proprietarty information, nor for the accuracy, completeness, usefulness, reliability, or timeliness of any documents or information contained on this website or for the suitability, functionality, or operation of this work. Barlow and Fibaro shall not be liable to anyone for any decision made or action taken, or not taken, in reliance on the information found on or dowbloaded from this website. Users are advised to do their own independent investigation before relying on or taking/not taking any action based on information found on this website. All information on this web site is subject to change or removal without notice. Barlow and Fibaro do not represent that use of any documents or information on this website would not infringe privately or commercially owned rights. Best place to ask questions and enhancements is on the Fibaro Forum. See link in the feedback and questions section above. I will be happy to you answer your question there. @Christian Wegerhoff. Thanks for your feedback. Version 0.6 of the Nuki Virtual Devices now adds two predefined global variables (nuki_state and nuki_battery_critical respectively); which are updated with the current lock state and the critical battery status, for use in block scenes. @Christian Walch. Vielen Dank für Ihr Kompliment und ja ich spreche ein wenig deutsch ;-) @Tony Cidade. Great feedback - thanks. I'm pleased you like it. Nicely done. Especially error handling. Suggestion: nuki_status should be a variable with predefined values, so it could be used in block scenes. (Block scenes only allow normal variables to be compared with numbers, not with text values as "locked".) Workaround: Before importing the VD create a variable with predefined values named nuki_status with the values "locked", "locking", "unlocked", "unlocking", "unlocked (lock ‘n’ go)", "unlatched" and "unlatching"